The scientific result described in this release is based on a presentation at the 233rd meeting of the American Astronomical Society in Seattle, Washington and published in The Astrophysical Journal Letters. The research was sponsored by grants from the U.S. National Science Foundation (NSF) Division of Astronomical Sciences and NASA. The National Science Foundation also supports the Gemini Observatory. Observations from Gemini Observatory identify a key fingerprint of an extremely distant quasar, allowing astronomers to sample light emitted from the dawn of time. Astronomers happened upon this deep glimpse into space and time thanks to an unremarkable foreground galaxy acting as a gravitational lens, which magnified the quasar’s ancient light. The Gemini observations provide critical pieces of the puzzle in confirming this object as the brightest appearing quasar so early in the history of the Universe, raising hopes that more sources like this will be found. A number of large telescopes were used to observe quasar J0439+1634 in the optical and infrared light. The 6.5m MMT Telescope was used to discovery this distant quasar. It and the 10m Keck-I Telescope obtained a sensitive spectrum of the quasar in optical light. The 8.1m Gemini Telescope obtained an infrared spectrum that accurately determined the quasar distance and the mass of its powerful black hole. U Arizona Large Binocular Telescope, Large Binocular Telescope Interferometer, or LBTI, is a ground-based instrument connecting two 8-meter class telescopes on Mount Graham, Arizona, USA, Altitude 3,221 m (10,568 ft.) to form the largest single-mount telescope in the world. The interferometer is designed to detect and study stars and planets outside our solar system. Image credit: NASA/JPL-Caltech. The Gemini observations provided key pieces of the puzzle by filling a critical hole in the data. 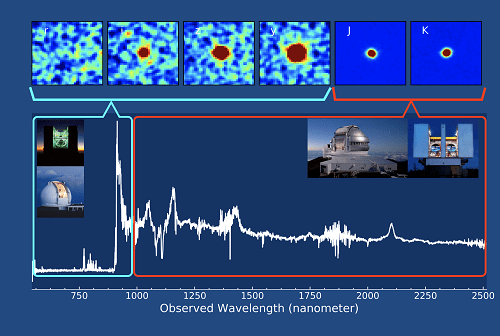 The Gemini North telescope on Maunakea, Hawai‘i, utilized the Gemini Near-InfraRed Spectrograph (GNIRS) to dissect a significant swath of the infrared part of the light’s spectrum. The Gemini data contained the tell-tale signature of magnesium which is critical for determining how far back in time we are looking. The Gemini observations also led to a determination of the mass of the black hole powering the quasar. “When we combined the Gemini data with observations from multiple observatories on Maunakea, the Hubble Space Telescope, and other observatories around the world, we were able to paint a complete picture of the quasar and the intervening galaxy,” said Feige Wang of the University of California, Santa Barbara, who is a member of the discovery team. That picture reveals that the quasar is located extremely far back in time and space – shortly after what is known as the Epoch of Reionization — when the very first light emerged from the Big Bang. The quasar is ripe for future scrutiny. Astronomers also plan to use the Atacama Large Millimeter/submillimeter Array, and eventually NASA’s James Webb Space Telescope, to look within 150 light-years of the black hole and directly detect the influence of the gravity from black hole on gas motion and star formation in its vicinity. Any future discoveries of very distant quasars like J0439+1634 will continue to teach astronomers about the chemical environment and the growth of massive black holes in our early Universe.